The time has come to add a canine companion to your family. The options are endless, but you can narrow them down substantially to getting a rescue dog. One reason to choose a rescue dog is this: they need a home. Even if they are in caring, “no kill” shelters, dogs do best in a home environment surrounded by love. Other reasons for getting a shelter dog include the fact that they are typically healthy, with vaccinations, spaying, and neutering, and they are far less expensive than a dog from a breeder or puppy mill. When choosing a rescue dog, it is important that you make sure to choose the right rescue dog. Dogs are living creatures, and you don’t want to have to send one back because you have a poor match. Before you go to the first shelter, assess your family situation. By assessing your situation, you can narrow your choices to find a dog with the lineage, temperament, energy level and age to fit in with your family. Am I home a lot, or will the dog be left alone for long periods of time? Do I have little children or am I planning to have children soon? What kind of flooring and furniture do I have and what type of dogs may fit best into my home? Do I have time to house train? Do I have other pets? Do I do a lot of entertaining? How often do I vacation? Do I have a budget for shots and veterinary appointments? Don’t just drop by the nearest shelter to choose a dog. Carefully decide which shelters you will visit. Ask your friends and family, and call the ones in your area. What is the shelter’s return policy? Will they allow me to take the dogs for a walk so that I can see how well we get along? Does the shelter provide medical and behavior information? It might be worth your while to take along a trainer or someone who is familiar with dogs. Tell them ahead of time what you’ve determined by following step #1 – what type of temperament, breed and energy level you are looking for. The trainer will be able to see things about your new dog that you might not notice. This could save you, your family, and the shelter dog a lot of stress and heartache. It’s easy to get caught up in the enthusiasm of getting a new dog or puppy and not taking steps to make sure you do what is best for yourself and for the dog. As much as it is important to fall in love with a dog immediately, a dog or puppy that is chosen hastily could end up being unpredictable, and that affection could go away just as quickly. What if, in the end, you determine adopting a rescue dog is not for you right now? There is no shame in changing your mind. You can always volunteer or donate to a shelter instead. Have you fostered or adopted a pet? What were your experiences? What advice would you give? 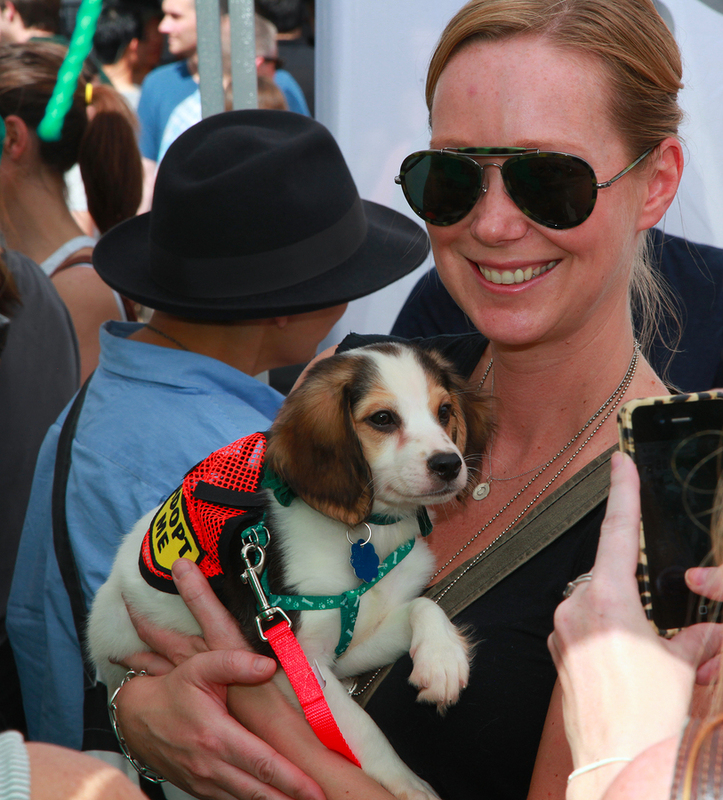 Photo Credit: Photo of Adoptapoalooza in Union Park – September 2013. The entryway of your home says a lot of about you. It is the first glimpse you are giving of your home, and into your life. 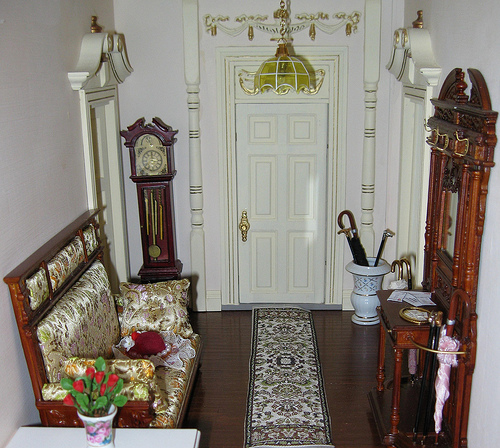 A cluttered entryway is not just disconcerting; it might be a hazard where someone can trip or fall. Whether your entryway is an open space, an alcove, or a closet, here are a few ideas for keeping it clean and organized. Don’t pack it full of stuff. Sure, it is convenient to have your coats, boots, hats, and scarves in one place, but unless you live alone, you will never be able to find the items you need on the way out the door. Put anything you don’t use every day in the appropriate place. As the seasons change, swap out your items putting away the ones you won’t need for the next few months. Keep items off the floor. Lifting items even a few inches off the floor makes he space seem bigger and cleaner. Consider using shoe racks where you can organize your most used shoes. Place items like umbrellas and sports gear in buckets or baskets, which can easily be pulled in and out of the entryway space as needed. Storage benches are a great way to create a comfortable seating place while hiding some of the doorway clutter. Use hooks and racks to organize coats, hats, handbags, book bags and other items towards the top of the space. Leave a couple of empty hooks for guests as well, so they won’t have to throw their jacket over a chair. Keep everyone’s stuff separate, especially if you have kids. If necessary, use labels or color so that each child knows where to place her or her “stuff.” Train them to put their items away every time they walk in the door, and your clutter problem will be eliminated. Cleaning the kitchen after a meal has got to be the least favorite chore. This is especially true if you have to do with burned on foods in your pots and pans. These tips will help you get your cookware clean in no time. Remember – you should not scrub pans that have a non-stick coating. Burned milk not only ruins your pots, but the terrible smell will stink up your home. You will want to clean that pot immediately by covering the bottom of the pot with salt, and covering with warm water for 15 minutes before cleaning it right of with a sponge. As for the smell, open a couple of windows and use the fan. Cleaning burns from a cast iron skillet is easier than it looks. Cast iron should be rinsed with hot water right after cooking before the food items dry onto the pan. For stubborn residue, use a little bit of salt and a paper towel to scrub at the stains, and rinse with hot water. 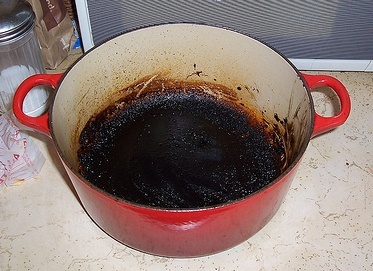 Scorched food on a pot can be cooked away in most cases. Put a 50/50 mix of water and vinegar in the pot and cook it for about 10 minutes. You will notice the burned of food loosening from your pots. A good scrubbing with a bristle dish brush will help you get all of the remaining grime. A long soak is probably unnecessary. Baked in and greasy foods in your lasagna spare-rib roasting pans don’t need to be soaked for a week to get it clean. Just fill your pan with water to cover the burnt on spots and place a used dryer sheet in the water. In 30 minutes, your pan will come clean with very little effort. Give it an extra once over with dish soap and hot water to remove dryer sheet residue. Prevent food from burning in the first place. Never walk away from cooking food. Find a project to do in the kitchen if you are waiting for your water to boil or your sauces to simmer. Turn off the pot before your rice, pasta, or eggs are done cooking. The heat from the pan will finish them off nicely. Turn down the heat on sauces, allowing them to cook slowly. Try lining some of your baking dishes with aluminum foil. Also, consider investing in quality pots and pans.